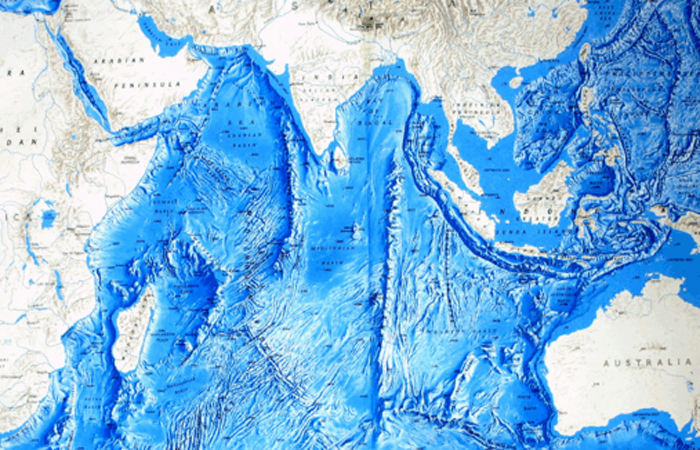 Important questions remain unanswered about the physical, biogeochemical and ecosystem phenomena associated with the complex geology and topography in the Indian Ocean. Numerous seamounts, ridges and plateaus strongly influence circulation and mixing/upwelling, and give rise to unusual and contrasting productivity regimes that are atypical of surrounding deep-water areas. They must serve as important aggregation points for feeding and reproduction of commercially important fish species, but neither this function, nor their biogeochemical significance, have as yet received adequate research attention. These topographic features must also strongly influence the deep Indian Ocean circulation, but little is known about these impacts either. In addition, the tectonically active mid-ocean ridges and their associated hydrothermal vent circulations inject trace metals and reduced compounds into the deep ocean. The fate and impacts of these trace metals are largely unknown, The reduced compounds provide the energy to drive chemoautotrophic production, which supports diverse hydrothermal vent communities, yet these have received relatively little research attention compared to the Atlantic and Pacific oceans. Three core questions identified by IIOE-2 are critical in the above context. What processes control the present, past, and future carbon and oxygen dynamics of the Indian Ocean and how do they impact biogeochemical cycles and ecosystem dynamics? How do the physical characteristics of the southern Indian Ocean gyre system influence the biogeochemistry and ecology of the Indian Ocean? How do the complex tectonic and geologic processes, and topography of the Indian Ocean influence circulation, mixing and chemistry and therefore also biogeochemical and ecological processes? Dr. Xuelei ZHANG China First Institute of Oceanography, State Oceanic Administration, Qingdao, China. Dr. Nayrah Abd El Nabi Ali Shaltout Egypt National Institute of Oceanography & Fisheries (NIOF), Alexandria, Egypt. Dr. Pawan Dewangan India CSIR-National Institute of Oceanography (NIO), Goa, India. Dr. Àan Johan Wahyudi Indonesia Research Center for Oceanography, Indonesian Institute of Sciences (LIPI), Jakarta. Dr. Makio Honda Japan JAMSTEC, Kanagawa, Japan. Mr. Leonid Shalnov Russia Dept. of Navigation & Oceanography of the Ministry of Defense of the Russian Federation, St. Petersburg.